Energy Performance Engineering is a SBA certified 8(a) firm. EPE is also certified as a disadvantaged business enterprise (DBE), minority business enterprise (MBE) and emerging small business (ESB) in the State of Oregon. COBID certification number is 4569. EPE is a trade ally for New Building and Existing Building by the Energy Trust of Oregon. Both of our principals are certified as accredited professionals in Leadership in Energy and Environmental Design (LEED). Energy Performance Engineering was founded by James Jen and his wife Elee Jen in 2005 after 15 years of experience in the industry. He was a Facility Engineer for high tech facilities, which gave him deep understanding of the needs of building owners. His well-­rounded experience came from working for designers and control contractors as well as teaching college level DDC course. James’ diverse background gives him a wholistic perspective on commissioning projects, which is rare to find in the industry. Energy Performance Engineering is currently participating in the Port of Portland’s Mentor Protégé Program. Our mission is making an enduring difference for building owners, one building at a time. Our vision is becoming a sought-after commissioning firm in the NW region. Please download our Qualification Statement. James pioneered Energy Performance Engineering, LLC (EPE) in 2005 with years of experience in mechanical systems design, facilities engineering, control contracting, and Commissioning. James assists clients with integrating performance and energy efficiency into building systems to meet the needs of increasingly complex and intelligent building control networks. James is a great asset because he has managed mechanical (HVAC) and direct digital controls systems Page 2 of 3 serving a 280,000sf advanced technology manufacturing facility and central utility plant. He has managed numerous controls and Commissioning projects that included carrying out Engineering Studies, making project schedules, providing cost estimates, reviewing construction drawings, and writing specifications. James Jen was born and raised in Taipei, Taiwan. Some of his early interests included sketching cartoons. In high school he excelled in drafting and remembers how time would pass quickly when he was engaged in his projects. His favorite sport was basketball. He was inspired by the NBA players in the United States, hoping someday he could be in the league. “I didn’t really have the height, but I was small, fast and very competitive,” jokes Jen. After recurring ankle injuries, Jen was forced to stop playing basketball. In 1976, James attended the China Maritime College. Prior to graduating, he needed to fulfill his school’s requirement for one year on a Taiwanese commercial ship traveling the world as a Marine Engineer. After graduating he spent two years in mandatory military service as a Navy officer. While in the Navy, he coached two winning basketball teams. James and Elee met in 1981 at OSU through a campus Christian fellowship. They were amazed at the number of similarities in their backgrounds and felt close from the beginning. The couple wed in 1985 and moved to Los Angeles, where James worked for McDonnell Douglas. 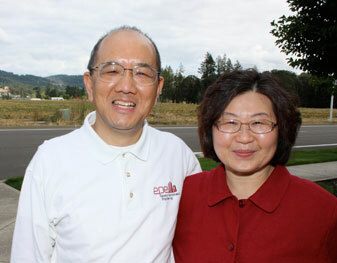 In 1994, James was hired by Seltec Silicone and moved the family back to Oregon. He worked for various mechanical and design firms since 2000. In 2005, James and Elee started Energy Performance Engineering. The company specializes in building commissioning, a service that ensures new buildings will operate as planned. Elee has been the Marketing Manager for the company and they’ve seen the business grow and become more profitable since 2010. In 1980, he was out of the military and began his Engineering studies at Oregon State University. Trades & Industry Department at Cascade Campus. Elee Jen is a LEED AP with a M.S. in Analytical Chemistry from Oregon State University and a B.S. in Chemistry from Soo‐Chow University in Taiwan, Republic of China. She is a principal of business development with Energy Performance Engineering assisting in marketing, finance and personnel functions since the beginning of the company. Mrs. Jen has five years of scientific instrumental experience in market development, trade show presentation, sales/customer training and public relations. She has worked in commercial science industry, research laboratory, marketing development, and communication system. With the combined science and marketing background, Elee Jen brings a rich understanding of business in industry trends and technologies that helps Energy Performance Engineering in development and advancement. Elee Jen was born and raised in Kaushung, Taiwan. Her father was an Academy instructor at the nearby Air Force base. Books were one of Elee’s early passions. She loved to read classical Chinese literature and detective novels. She remembers that all Taiwanese youth, even girls, received basic military training on shooting rifles and survival skills. “Growing up, it was ingrained in every family to be mentally and physically prepared for the threat of war,” recalls Elee. In 1977, she graduated from Soo Chow University with a degree in Chemistry. Shortly thereafter, she moved to Corvallis, Oregon to begin school for her Master’s Degree at Oregon State University. EPE provided a great resource for the commissioning process during this process. It is clear that Jimmy has a deep understanding of the project requirements and that he was working to drive the project to a successful completion. As discrepancies arose, Jimmy provided insight based on his knowledge and helped all parties come to the conclusion that was best for the project. The testing plans developed by EPE were very thorough and they allowed for us to have a successful testing phase before building delivery. Energy Performance Engineering, LLC was named Minority Business Firm of the Year at the October 2014 Minority Enterprise Development (MED) Week. In the Winter 2011 PCC Communities newsletter, EPE was one of the companies highlighted for their participation with the construction of the PCC Newberg Center.”Last April, the Jens’ hard work paid off when PCC awarded them a contract to provide commissioning services for the new facility”. Energy Performance Engineering, LLC (EPE) assists clients to integrate ultimate performance and energy efficiency into building systems to meet the needs of growing complexity and intelligence of building control network. The value of EPE’s commissioning services is beyond finding and documenting deficiencies. We help building owners make the best and most use of their facilities in preventing problems and demonstrating compliance with Basis of Design and Owner’s Project Requirements through commissioning. We respect your privacy. Energy Performance Engineering (EPE) collects, uses, and protects information obtained from you on this website. We ask for only the information we need to provide the service you’ve requested. EPE does not use or disclose information about you or information that you may give us, such as your name, address, email address or telephone number, to any outside companies or parties. We do not rent, sell, or trade any of our mailing lists. EPE provides individuals with the right to opt-out of receiving email marketing and to update, supplement or delete their own voluntarily submitted personal information which EPE uses for the previously noted business purposes.